One of the most consistent things you will see in a clean home is that everything has a home and everything is in it’s home. You can have a disheveled room and pick up and have it clean in just minutes if everything has a place to live. If an item has no place to live, it is wandering aimlessly around the house from one flat surface to another feeling out of place and awkward. Imagine how that whatchamacallit you ordered from Amazon must feel. It got ripped from a shelf, shut into a box and thrown into a truck. After a few rough rides, air turbulence, conveyor belts and another truck ride, it landed at your front door hoping for a warm welcome and a good home. Alas, it’s been moved from coffee table to kitchen counter to dining table, never really fitting in. All it wants is a real home. A place where it belongs. Have a heart! Find your whatchamacallit a home! In all seriousness, establishing where something will live eliminates frustration when cleaning, it also helps prevent procrastination. As a bonus, you will always know where something is when you need it! Which also means you can delegate when necessary because you know where things are! Next time you bring something into the house, think about where it’s forever home will be and put it there. NOT a temporary home on the dresser for now. You can have a clean home for a hot minute without a home for everything but it won’t be that way for long. An organized home has a home for everything. Making sure nothing is left homeless will save time cleaning, make your home more stress-free and allows you to do more of what YOU want to do! We are in the middle of summer here in North Idaho, but I am already looking forward to fall! I love fall! The cool crisp air, the beautiful leaves, the boots, scarves and pumpkin spice lattes! Yup, I am that girl. Apples are another of my fall favorites. We go apple picking at a local farm every year. Our whole family goes together. Hot fresh apple cider warms your hands while you stand in line for the pumpkin doughnuts, the aroma alone is worth standing in the long line. Local vendors are selling their homemade goods. Kids scream with delight at the bounce houses and beg to get their faces painted. Wonderful memories are made there! So when I stopped in a roadside fruit stand and found Honey Crisp Apple for $12.95 for a giant box I had to get them! I can’t wait to go pick them myself but just couldn’t pass them up at that price. So let the apple cooking, baking, eating begin! One of the first things I did was make a fresh apple cake. Seriously one of my favorite “apple” things! I peeled four apples. I needed four cups of apples but these things are the size of my head so I ended up with eight cups! I put the other four cups in a ziplock bag with a couple teaspoons of Fruit-Fresh and some water and put them in the fridge for something else. I used my really cool apple peeler /corer to peel the apples. Super easy and fast! Yummy!!!! Warm with Vanilla Bean Ice Cream is the way to go! Cream butter and brown sugar together. Blend in eggs. In a small bowl combine salt, soda, cinnamon, and flour. Stir into shortening/sugar mixture. Fold in apples. It will be very thick. Put in a greased 9×13 baking pan. Combine melted butter and sugar and sprinkle over top. Sprinkle with chopped nuts. Bake in a 350 F oven for 50 minutes. Check for doneness with a toothpick. Serve warm or room temperature with vanilla ice cream. Click on this picture to order Fruit Fresh from Amazon! This stuff is great! I cut up apples for my husband’s lunch, put a little Fruit Fresh in a ziplock bag and some water, add the apples and shake! No brown apples! This apple peeler/corer is a huge time saver! You can even peel potatoes with it!! WOW! Click on the picture to order! I say that over and over in my head all the time as I move throughout my house. It just stuck. It might be silly, but yes, sometimes I just smile in a room all by myself. I fluff the couch pillows and set them straight. I straighten the shower curtain when I am in the bathroom or wipe the toast crumbs off the counter when I get a drink. Sometimes I look around and don’t see anything right off that needs attention so I just smile and mentally bless my home! My favorite way to clean the shower is with a cloth and some body wash or shampoo while I am IN the shower. It is a million times easier, you are already in there and already wet! I do that at least once a week and my shower never looks dirty. I do, however, like to use a good shower cleaner to really get a good clean and get the water spots off every few weeks. This is the best one I have found. I have used several and I have been happiest with the Scrubbing Bubbles Shower Foam! Click the link or the picture to purchase on Amazon. When you do you are helping to support me at no extra cost to you! Thanks! 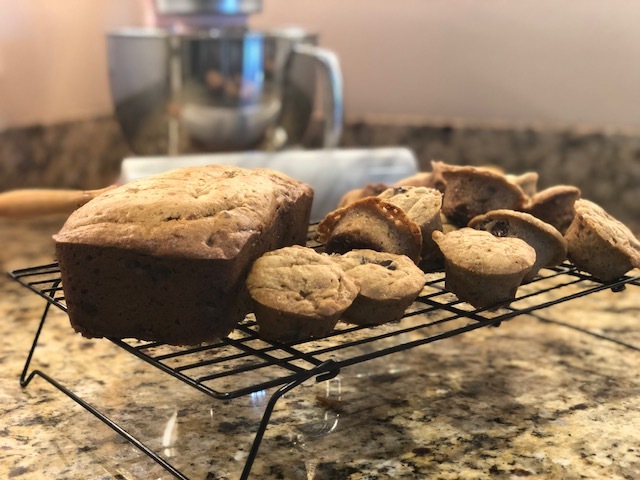 I made banana bread this week. Yummy! It hasn’t exactly been baking weather but I had 4 brown polka dot bananas left from the week before and I just couldn’t in good conscience leave them there! I didn’t have any walnuts or pecans but I did have some chocolate chips that I threw in there instead. I must say it may become a thing now!! Have a happy weekend and don’t forget to improve every room you are in, if only just to smile! “>Click here to check out the awesome program I use for all my recipes and menu planning! Grease 3 small loaf pans or 2 small loaf pans and a muffin pan. Sprinkle the bottom of the pans with brown sugar, sugar, and cinnamon. In a blender, puree bananas, eggs and vanilla. Set aside. In a large bowl, beat shortening and gradually add sugars. Stir in banana mixture. Whisk together flour, baking soda, and salt blend into batter. Add walnuts if desired. Divide between the prepared pans. Sprinkle the tops with more brown sugar, cinnamon, and sugar. Bake for 1 hour 15 minutes in the preheated oven, or until a toothpick inserted into the center of the loaf comes out clean. Muffins, depending on size will bake 40-50 minutes. Check with toothpick for doneness. I can feel it staring at me. In the kitchen, the office, the bedroom closet. Every room I enter it is there. Glaring at me, threatening to overtake my home, to suffocate me and make me it’s slave. I make my way down to the laundry room searching for an escape from it but it has grown and I feel even more helpless to escape its clutches. I am too afraid to open the pantry door. The walls seem to be caving in, the rooms shrinking! The clutter has taken on a life of its own!!!! Panic attack! It started in a seemingly innocent way. I was just going to put that box of old photos away somewhere but I needed to find a place first. This is a really neat bag, I might need this for something. I might need all those old towels someday…I will file that paperwork later…I might want to pick up cross stitch again someday in my spare time. I will just put the cans in the pantry and shut the door really fast. I have been feeling a bit overwhelmed lately by all the “stuff” we have collected. It sneaks up on you, doesn’t it?? I swear I didn’t see it coming. It seems to multiply and we don’t even notice. I start to walk by the piles of things and shut them out. I become blind to the stacks of things on the counter, the overdue library books by the door, the neighbor’s cookie plate on top of the fridge. They become like furniture, it’s just there. It gets easier to set things down on the piles or just in the general area of an item’s home rather than actually put it in its home. Then one day, you notice. You go from room to room with eyes wide open. Your palms sweat, the clutter seems to mock you. You feel helpless and confused. How did this happen?? It’s called “Entropy”. Entropy is the Second Law of Thermodynamics. It states that everything goes from a state of order to disorder. It is the natural tendency of things to lose order. Without countermeasures, life will always become less structured. Without care the lawn dies and weeds crop up, cars rust, barns collapse, pantries become unorganized, garages become a mess, marriages crumble, families fall apart. Entropy increases over time. The state of something will continue to decline without effort on our part to restore order. So, why doesn’t the junk drawer stay organized? It’s science! The good news is we CAN combat entropy. In fact, God put us here to do that! God expects us to put out the effort to keep our home, our land our cars, our space in general, in good order. Do you REALLY need it, want it, love it? If not, get rid of it. Don’t set it down. Be present. Pay attention to your surroundings. Don’t walk over the same gum wrapper on the garage floor for a week. Pick it up and throw it away. Now, since I have been slacking on my own advice and the clutter is leering at me, I am going to go on an anti-entropy quest! Click here to get the awesome program I use for all my recipes and menu planning! Put water and oil in the bottom of the bread machine. Put dry ingredients on top. Start on “dough setting”. When it’s done turn onto a floured surface and knead to deflate it. Divide into two equal pieces. Let it rest for 10 minutes. The second ball of dough can be frozen at this point for future use. Roll and stretch the dough and form it on a pizza peel that is heavily dusted in cornmeal. Place pizza stone in oven and heat to 500* for 30 minutes. Saute ground beef until no longer pink and drain. Add taco seasoning and 1/2 cup water. Simmer until water has evaporated. Mix refried bean with salsa and stir until smooth and spreadable. Gently spread over prepared pizza dough. 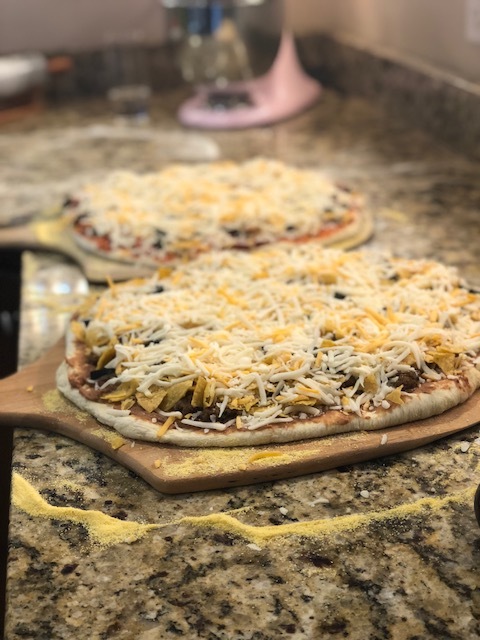 Top with seasoned meat, olives, red onion, crushed chips and then cheese. Carefully slide the pizza off pizza peel onto the hot pizza stone. Bake for 10-15 minutes watching closely. Remove the pizza using the pizza peel. Serve with lettuce, tomato, sour cream, jalapeno, and hot sauce. This cool ottoman/toy chest/storage chest is just the thing I need for scarves, hats, gloves, and umbrellas in my entryway! Click on the pic to order! Look at this totally adorable water bottle! My granddaughter is really into unicorns! She also likes to steal my stainless steel water bottle because the water stays so cold! So I think this is just what she needs! I have a confession to make. I am not your born organized, super OCD, perfectionist. I have always said that I am a “perfectionist wannabe”. I WANT everything to be organized and pretty, but with an in-home daycare, a big family, homeschooling my kids, always doing some side job, etc., it has always been a struggle for me. My brain NEEDS it to be clean and tidy to think clearly and not be stressed, but it doesn’t come naturally to me. I am a hard worker and I have always tried hard to keep a clean home no matter how much I had on my plate, but then I would see other people’s homes and realize just how NOT clean and organized mine was. This is Aimee’s hall closet. See what I mean?? She used dollar store bins and labeled everything with her pretty handwriting! It’s a thing of beauty! I won’t show you mine. It is semi-organized with cardboard boxes and some plastic ones marked with my label maker. My towels are not lined up perfectly, my boxes and baskets are overflowing and there is just way too much stuff in there. That picture right there inspires me! It can also make me frustrated with myself. I used to let things like that bother me, I still struggle with that. I would compare myself to others and beat myself up for not being that good. I still want to improve myself and my home and my organizational skills daily but I am really working to not beat myself up! I don’t want you to either. We are a work in progress! I use routines that I have made into ingrained habits that keep my house pretty clean. I still have a long way to go in the organizing and “closets that look like art” department, but I’m working on it! 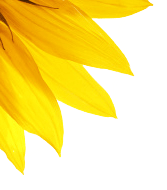 I often feel like I am not qualified to write this blog, I am so far from having a “perfect home” but I know I have something to share with you. Ways that I have found to maintain some order in a chaotic life! Don’t compare yourself to others and beat yourself up. 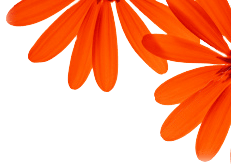 If you liked this blog please share it with your friends and be sure to enter your email address so that you can receive notifications via email when there is a new post! 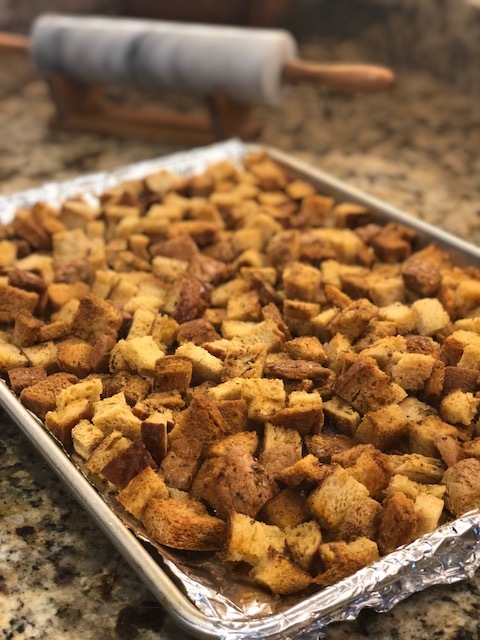 Have you ever made homemade croutons? They are delicious! Yes, dried bread that is delicious! If you think about it, why BUY dried bread that isn’t really that good when you probably already have everything you need to make a whole bunch of super yummy croutons for your salads this summer! 1 loaf cubed bread It can be random types of bread you have left over. Just fill a baking sheet. Preheat oven to 325F. Line a baking sheet with parchment paper. Put bread cubed on a baking sheet. Pour melted butter over all. I hold the cup up kind of high so it is a small stream and doesn’t all go in one spot. Liberally shake Italian seasoning and garlic herb seasoning over bread. Stir with a pancake spatula, kind of turning it over. Shake on a bit more seasoning. Bake for 15 minutes at a time. After every 15 minutes, take out and “stir” again. Sometimes it takes an hour sometimes only 45 minutes. You can tell by how dark it is getting. Let them sit out on the counter for several hours before storing. Try not to eat them all before they make it to a ziplock bag! Check out this adorable picnic basket! Isn’t it just the cutest?! It’s insulated too! I am going to use it for my daycare. I am going to pack our water bottles, snacks, and wipes in it when we spend the mornings playing outside. Click on the picture to order it on Amazon and when you do, at no extra cost to you I get a little kickback. Thank you for supporting me! This cool shelf is going in my laundry room. It will fit perfectly and will nicely hold baskets, detergents, extra towels and cleaning supplies. Click on the picture to order from Amazon! I love lists. I love making lists, reading lists, marking off things on lists. I make lists in my head all the time but they need to make it to paper or device quickly or I am sure to forget something. I guess that is why I like them. They give me a sense of security and peace. I thought I would give you a list today! Just a fun list of twenty reasons to keep your house clean. 2. You can find things in a clean home. 3. Your home is a reflection of you. 4. You can truly relax in a clean house. 6. A clean house is healthier, fewer bacteria and germs. 7. A clean house attracts fewer insects and pests. 8. You will always be prepared for company, or close to it. 9. You don’t trip over things in the dark. 10. If the house caught fire, you could easily get out or First Responders could easily get to you. 11. If you get the stomach flu, at least the toilet is clean! 12. You make better diet and exercise choices in an uncluttered space. 13. People enjoy coming to your house. 14. You enjoy friends coming to your home. 15. You enjoy coming home to your house. 16. Your kids like bringing their friends over. 17. You can have “me time” guilt free. 19. You can be proud of your home. 20. You and your family deserve it! I can’t resist sharing this little thing right here! Seriously….how cute is he?! He is our new little ball of fur and absolute adorable terror. It is a good thing God made them so cute! I mean, you can’t resist that adorable little face and his sweet little purr, until 3am and he is sticking his needle-sharp claws in your nose and wants to play! His name is Finn and we are in love! I hope you all have an amazing Memorial Day Weekend! Go out and make memories! 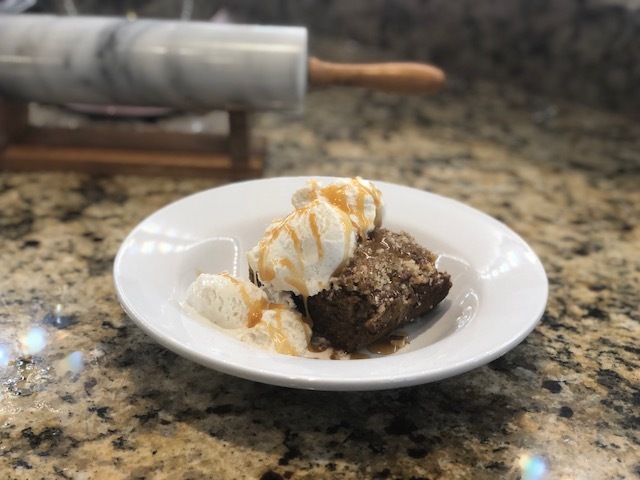 Be sure to click here to get the awesome Cook’n program I use for all my recipes and menu planning! Mix Italian bread crumbs with panko in a large dish. Place a baking rack on a baking sheet and spray it with pan spray. Slather each chicken breast with mayo and dredge in breadcrumbs and panko. Put breasts on the prepared baking rack. Cook in the oven for about 30 minutes or until internal temperature is 155*. Take out and let rest. 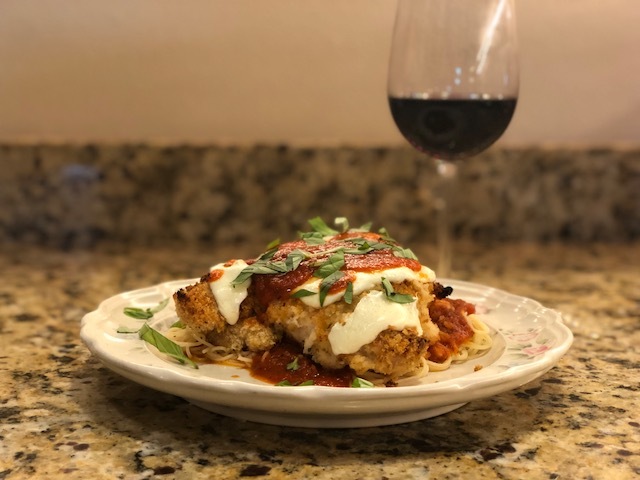 Top each chicken breast with fresh mozzarella. Turn oven to broil and return chicken to oven and watch carefully until cheese starts to melt. To serve, place pasta on the plate pour sauce over. Place chicken breast on top and top with fresh basil. This was a lot of work. It was a labor of love. Nothing good comes without some hard work. If you ask my granddaughter or daycare kiddos, this playset is VERY good! They are delighted. This is going to bring hours of happiness and memories. Work is a good thing! A good work ethic is something to be admired, rewarded and something we strive for in our place of employment and at home. God made us to need to work. We would be very unfulfilled without work. God worked! God worked for 6 days when he made the earth and then He rested. Do I think He needed to rest? Nope. Not at all. God made us in His image so I believe He was simply showing us how to pattern our lives. We need to have a balance in our lives between work, rest and play. Work doesn’t stop when you clock out. It just changes form. There is no getting around the fact that there is work involved in a clean house. Good habits and routines will drastically reduce the amount of housekeeping that has to be done, but let’s face it, the vacuuming, mopping, and scrubbing toilets still have to happen. I am going to share some tips with you to help you work smart, not hard, to get that work done and still have time for rest and play. Enlist help. Like my husband did with the swing set, get the family to help you. Kids, even little ones can help. The bigger ones definitely should help! Your children need to learn to work. It’s a life skill they will appreciate learning! (Eventually!) They need to learn how rewarding a “job well done” is. How nice it feels to have a clean room and how proud you feel of your home when it is clean. I, personally, don’t feel that rewards or allowance for doing household chores is beneficial. I don’t get paid to clean my house. The reward comes from feeling good about the job you did. Teach them to take the time to enjoy the feeling of accomplishment. 2. Make it fun. Whether it is just you or the whole family involved in cleaning, make it fun! Make it a good time rather than drudgery. If you hate it, your family will pick up on that. Why would they want to help do something that is clearly a terrible thing? Fake it till you make it if you have to! Put on some music dance with the broom, sing loud and silly! Do whatever it takes to make it fun. When my kids were elementary school age, we made it a game. I wrote every chore that needed to be done on an index card. I broke the chores down into very specific things. “Clean upstairs bathroom tub”, “Clean downstairs bathroom toilet”, “Mop kitchen”, etc. The index cards were placed upside down on the kitchen table and mixed up. A bell was in the middle of the table. We all gathered around the table. I would ring the bell and start a stopwatch. We all grabbed a card and ran to do the chore on our card as fast as possible. When the chore was done it was placed in a discard pile, you got to ring the bell and then grab another card. It was wild and hilarious! I am sure we looked ridiculous running like crazy people through the house, breathless, tripping over the vacuum, running into each other, the bell ringing loudly and often. The person with the last card got to make crazy noise with the bell and stop the stopwatch. Housekeeping got done in generally less than twenty minutes! Crazy, right? And it was FUN! It may not have been done perfectly but it was done, everyone was happy and we could go spend our day doing something really fun and come back to a clean house. 3. Break it up. Everyone’s life looks a little different. For some doing a housekeeping game on Saturday morning with the family will work. Now that my kids are adults, I have the housekeeping responsibilities myself. I do not want to spend my Saturday cleaning all alone. I choose to break up my chores and do one or two each day before or after work. The things that may take longer I do on days that I usually have more time or more energy. Most things really don’t take all that long. It always remains the same so I always know what day I am doing what. Monday is laundry and vacuuming, Tuesday is bathroom day. I clean the toilet, the tub and take out the trash and wash the bath towels. Wednesday is sweeping and mopping the house and menu planning. Thursday is the kitchen and some miscellaneous things. I take Fridays to do anything I may not have been able to get done during the week or just take the day off! That is just an example. You know your life and how that might look for you. 4. Do It Weekly. Don’t procrastinate and wait until you stick to the kitchen floor and the tub has a nasty ring around it. Do it while it still looks clean! It is so easy to clean a fairly clean tub in comparison to the full aerobic work out to clean a yucky one. It is house “keeping” rather than the house “cleaning”. The goal is to maintain, not struggle to clean what is already dirty. This saves a major amount of time! We had some AMAZING Chicken Gyros the other night! I love Gyros and love the traditional lamb, but these were a great switch and super light. Perfect for a summer evening on the patio with a wine spritzer and family to share it with. Speaking of wine spritzers, if you haven’t had these, you should! YUM! Here is the link to the Chicken Gyros. We grilled them outside instead of baking in the oven. Was fantastic! Go check out a Bitchin’ Kitchen! Please check out the program I use for all my recipes and menu planning! I couldn’t do life without it! Cook’n is an amazing tool! Memories being made right here…..
We went camping last weekend!! Yes, it rained and possibly snowed just a bit. It was cold and wet, but we went camping!! I am just a little excited that the camping season is upon us. At least for us crazy diehards, it is. We did go to our State Park where we had electric hookups. We didn’t go all survivor style or anything. We just needed to get away for a couple of nights and have some nature therapy. I love the fresh air, the dirt, the grass, the trees and walks in the rain and roasting marshmallows. Most of all I love the memories we are making. Memories are what holds families together. Memories will be what’s left when we are gone. I want to give my family a clean, organized home that is a comforting safe place to be and leave them memories that will live on long after I am gone. I know that sounds like having your cake and eating it too! How do you have time to make memories if you are keeping a clean and organized home? I know for me, personally, I had a tough time trying to balance cleaning and laundry and cooking with spending time with my kids. I loved reading to them and baking with them and working on schoolwork together, but it was hard to do when I had so much that had to be done! I knew that there had to be a better way. I have spent years developing that “way”! Thinking it out and perfecting my system. I wish I could have had my ducks in a row when my kids were really young. I hope they knew I was trying! It is my goal and passion to pass what I have learned on to you! Breaking down household chores into little bits and doing those little bits each day, establishing habits that are seemingly effortless, and eliminating excess, creates what is the “Self Cleaning House”. Eliminating things that create clutter helps to cut down your workload and keeps your house tidy. More is NOT better. Less is best! For example, I HATE dusting! The best way I avoid doing this job is simple. I just don’t have things that need to be dusted. I am a minimalist when it comes to knickknacks and decorations. Having very few “things” makes a room look more open, less cluttered and just simply beautiful. It makes it easier to tidy up and much easier to do the dreaded dusting. Less “stuff”, even if its pretty “stuff” gives the illusion of a much more tidy home. We get used to seeing our stuff. It becomes like furniture. It’s just there. Even if we don’t like it, it just sits there and pretty soon we don’t see it anymore! Do yourself a huge favor this week and take a close look around. Walk into your home and pretend you are a guest. Look at everything with fresh eyes. What do you see? What do you like? What don’t you like? What looks out-of-place or outdated or just blah…? Then gather all those things up and take them immediately to your local St. Vincent’s or another thrift store you choose to support. Don’t stick them in the garage or closet just creating more junk to clean around. Be rid of the stuff!! Just say NO to stuff! Dusting a flat surface takes very little time. I still don’t enjoy it but at least it doesn’t take long. Less time doing housework equals more time with your family and more memory making! Get rid of some stuff and go do something you love! We had a super busy weekend. Granddaughter Brooklyn had an Ice Skating Competition in Montana. It was a great excuse to have a weekend away! Sometimes you really need a three-day weekend to recharge. We got to stay in a pretty nice hotel, go swimming in the pool, sit in the hot tub and enjoy some good food as well as watch some amazing skaters! Brooklyn did great! We are so very proud of her. Her dedication really shows. She is going to need a whole closet for her medals soon! She was pretty wiped out on the trip home. She worked hard! Since we were in Missoula, we had to stop at Wheat Montana Farms & Bakery . I use their flour and oat cereal exclusively for my bread, baking, and granola. It’s great stuff!! I can’t purchase it in fifty-pound bags locally so whenever we are anywhere near Missoula we stop in and buy it there. It had been quite a while since I had been away for a weekend but my inner checklist for what to do before leaving kicked in. Doing these few simple things before leaving not only gives you peace of mind while you are away but makes coming back so much easier! *The day before you leave be sure you are caught up on laundry. You are going to have plenty when you get back. *Plan what you are going to have for dinner the day you get back. You will have just spent money all weekend going out and the last thing you want to do is spend more money on pizza your first night home. *The day you leave run the dishwasher and empty it. Don’t leave any dishes in the sink. *Make sure there is nothing in the washer or the dyer. If there are clothes in the washer they will get sour and if there are clothes in the dryer they will be wrinkled. *Tidy up and make the beds. *Make sure the animals are taken care of. *Close the blinds and turn down the thermostat. *Turn off the lights, leaving one on. *Lock the doors. Make sure someone else has a key in case of emergency. I went through all these things before leaving for the long weekend. Our cats are used to us being away for a couple days a week in the summers and they are usually fine. This time, however, they must have been playing around the bathroom door while we were gone. One of the cats got shut in the bathroom. I don’t know how long he was in there but he sure let us hear about it when we got home! I still think his sister had something to do with it. Pretty sure I saw her grinning. I wouldn’t put it past her! See what I mean? Evil looking, isn’t she?! Don’t let her fool you, she is straight up crazy! 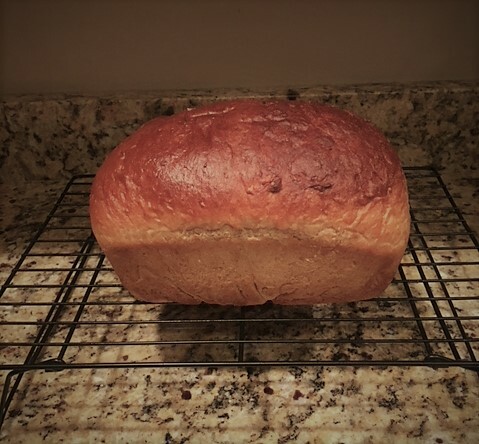 I am going to leave you with my whole wheat bread recipe. I hope you enjoy it! Be sure to take a long weekend and recharge your batteries soon too! Click here to get the awesome program I use for recipes and meal planning! Mix all dry ingredients in a medium bowl. Put warm water, butter, and vinegar in bread machine pan. Dump in dry ingredient on top. Start bread machine on “Dough” cycle. When done kneading and rising, work the dough a bit to get out air bubbles, shape into a loaf and put into greased/sprayed loaf pan. Heat oven to 375* and let the loaf rise to about double. Bake for 27 minutes, turn pan around and bake for 3 more minutes. Remove from oven and brush with butter. Let cool for 5 minutes and then turn out of loaf pan onto a cooling rack. Let cool for at least 2 hours before cutting. Store in a ziplock bag. I did some fun studying this week. Yes, I said fun. I am weird like that. I love studying and learning new things or learning more about something I am interested in. I am fascinated by how our brains work, always have been. This week I dove into something I have studied a bit about before but wanted to learn more so I could share it with you! The dictionary defines a Habit as an acquired behavior pattern regularly followed until is has become almost involuntary. It is a simple form of learning. An automatic response acquired as a result of repetition. A habit does not require conscious attention. We use habits every day. Every moment of every day! Good habits as well as bad habits. When was the last time you had to remember to breathe, or even how to tie your shoes? You just do it without thinking. It is a habit. I have a terrible habit of clenching my jaw. I have absolutely no idea I am doing it until my jaw hurts. It has become such a habit, a bad one, that it is unconscious. My Self Cleaning House plan revolves around habits. Doing the same simple things, the same simple way, every single day until it becomes such habit that it seems your house cleans itself. It does not require conscious attention anymore. Sound good?! In order to set that in motion, I think it is important to learn a bit more about habits and your brain and how you can control the habits you want to make or break. Lifehack right here!!! I am not the least bit nerdy or “science-y” so bear with me as I explain what I have learned about habit formation in my own words. There are three different types of habits. Motor habits: physical actions, posture, walking, standing, tying shoes, muscle memory type things. Intellectual habits: psychological, observation, logical thinking, reasoning, common sense. Character habits: related to emotion and feelings, trusting, honesty, friendliness, time management, work ethic, cleanliness, charitable, sympathetic. Ok, that is sort of interesting but how do we form new habits or break old ones? How does this relate at all to having a self-cleaning house? A habit, good or bad, can be broken down into three parts. Knowing that your brain works this way is almost like having a cheat code for life! The cue. Let’s use something we all do, brushing our teeth. We get up, stumble to the bathroom and stand in front of the sink. That is our cue. We can do this still half asleep and usually do. The behavior. We grab the toothbrush and toothpaste and start brushing. Our muscle memory even takes over here because we all know we brush our teeth the same way, every single time. Just ask your dentist. The reward. Ahhhhhh… nothing like having fresh breath once again as you begin to feel human and slightly awake. A clean mouth is a wonderful feeling! So in order to form a habit to begin to make a self-cleaning house we need to decide first of all what habit we want to cultivate. Let’s say cleaning your bathroom each morning. That is the behavior you want. The cue would be what you do just before this habit should be done. We are going to “attach” this new habit to an existing one making it far easier to achieve. In my case that would be finishing up my make up and washing my hands. As soon as I dry my hands I put my makeup under the sink and grab my cleaner. I take that hand towel and cleaner and give the mirror a swipe if it needs it, wipe down the sinks and countertops and get the toilet seat too. Toss the towel in the laundry. I just timed myself. I didn’t hurry and I cleaned the entire mirror. I have a large bathroom with two sinks. It took me 80 seconds. My smaller bathroom took 50 seconds! The reward is a clean bathroom. Ok, I know it’s not like that great feeling when you brush your teeth or win an Olympic medal, but take the time to admire how great it looks! We usually don’t follow through with making habits because the reward isn’t great enough or instant. So pat yourself on the back, smile and know that you are one of few who are going to work this morning with a clean latrine! Anyone that stops by can use the potty without fear of the creepy crawling gunk and wash in a toothpaste drool free sink. You know what? Even if no one stops by, I get to use a clean fresh bathroom and so does my family. To me, that is pretty much an Olympic medal, or at least as close as I am going to get! Reward: Olympic medal! Ok, it just feels that way. You have a beautiful clean bathroom to be proud of. If you continue this ritual every day, yes, everyday, no weekends off, no “I don’t feel like it” days, no “it’s not fair I always have to do it” days, and no “I am in a hurry” days. (Remember the 80 Seconds?) you WILL develop a habit so strong and ingrained you couldn’t stop if you wanted to. Some quick tips to make you more successful! START! Be determined. As I always told my kids, “There is no try, Only do or do not.” I may or may not have made my kids hate Yoda. Keep it up! Be consistent without interruption. Excuses will kill a habit formation instantly. Have a positive environment. Help yourself to be successful. If you are cutting out junk food, having a cupboard of it will not be helpful. You know yourself best. How can you help yourself? Write yourself notes to stick on your mirror to remind you, Stay away from people who aren’t contributing to your success at your goal, etc. Don’t quit! Even when you think you have established a habit, don’t stop. Enjoy it! It is so important to take time to enjoy what you have accomplished by your new habit so the positive is reinforced in your brain and it will want to continue to practice the habit. I hope you enjoyed that little study session! Now here is one of my family’s all-time favorites! Can you tell we like soup in the winter?! Preheat oven to 325 F. Place the pork on a plate and sprinkle with flour, then gently toss to coat. Heat half the oil in a large Dutch oven over medium-high heat. Add one-third of the pork and cook, turning occasionally, for 2-3 minutes or until brown all over. Transfer to a bowl. Repeat in 2 more batches with remaining pork. Heat the remaining oil in the pan over medium heat. Add the onions, celery, carrots, fennel and garlic and cook, stirring occasionally, for 5-8 minutes. Add the pork, apple and cider and bring to the boil. Add the chicken stock and bay leaves and 1 T of the chopped sage and stir to combine. Remove from heat. Bake, covered, stirring occasionally, for 1 hour or until pork is tender. Bake for a further 30 minutes (IF necessary!) or until pork is tender. Taste and season with salt and pepper. Remove from oven and place on stove. Add 1-2 more cups of chicken broth/cider to create enough liquid to cook dumplings. Taste for seasoning and add salt and pepper as needed. Heat over medium high heat. For the Dumplings: Stir the flour, baking powder, and salt together. Microwave the milk and butter in a microwave-safe bowl on high until just warm (do not over-heat), about 1 minute. Stir the warmed milk mixture and the sage leaves into the flour mixture with a wooden spoon until incorporated and smooth. Drop golf-ball-sized dumplings over the top of the stew, about 1/4 inch apart (you should have about 18 dumplings). Reduce the heat to low, cover, and cook until the dumplings have doubled in size, 15 to 18 minutes. Serve. Don’t forget to check out my all time favorite recipe and meal planning program here! I love paper. I love index cards. I love all things office supply. Office Max practically makes me giddy! I remember as a kid in grade school wanting to be the one chosen by the teacher to go to the paper room for her. It smelled so good in there and all that fresh clean paper! I know, weird kid, huh? I am a hands on, actual pen and paper person when it comes to lists and calendars. It’s nice to have on my phone or computer but I really need to have it physically written as well. For years I have had my housework organized on index cards. It has worked well for me and still does. I still have the chores on index cards that I made for my kids when they were young. They have memories of those cards, I want to say fond memories but I can’t be sure of that! Although they have said I can’t get rid of them. I keep my box of index cards on my kitchen counter. I have a cat. Actually I have two cats, but one is quite mischievous. I woke the other morning to find my entire box of index cards scattered on the kitchen floor. I was extremely irritated but took a deep breath and decided to use this as an opportunity to be re inspired and reorganized. My husband bought me new index cards, not just plain old white ones but colored ones! He said he thought I might enjoy color coding them. I think he knows me pretty well! I have been sorting and writing new cards and trying to come up with a new system all morning between loads of laundry and changing diapers and I think I have come up with a pretty good plan! It’s not perfect, it doesn’t look perfect, but it works for me. Whatever you do, should work for you. Whether it is just a sticky note on your mirror reminding you to make your bed or a full spreadsheet with every possible household duty listed, make sure it is working for you. We are all different. If it is overwhelming you, it’s not working. Simplify. If lists are your jam then get some fun note paper for that. If you are weird like me, try color-coded index cards. Don’t get bogged down with the details. Just have a system that works so you can spend less time playing “catch up” on housework and more time just playing! Now…… which one of these terrors is to blame?